Since Socrates, the effort to understand ourselves precisely as human has been the central occupation of Western thought. 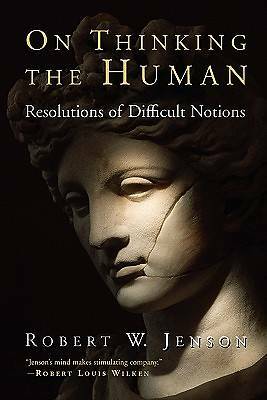 In this short, profound book Robert W. Jenson argues that not only are all philosophical attempts to accurately think the self doomed to failure, but also that the category "human" is"unthinkable"without reference to God. As Jenson says at the outset of the book, "our anthropological endeavors are at once impelled and checked by an epistemic quirk or set of quirks: notions we need to use and do use when we talk about ourselves as human resist being thought. ""On Thinking the Human," which tackles this problem theologically while also giving a nod to philosophic heavyweights like Hegel, Nietzsche, and Heidegger, is a concise attempt to explain why this is so. Under chapter titles that reflect the problem's different facets "Thinking Death," "Thinking Consciousness," "Thinking Freedom," "Thinking Reality," "Thinking Wickedness," and "Thinking Love" Jenson limns the difficulty inherent in each concept and then shows how the unthinkable becomes thinkable in light of the triune God of Scripture."